Winnie Mandela's extraordinary life has been marked by a process of harassment from the regime and by constant separations from those she has loved. Her mother Nomathamsanqa Mzaidume, a domestic science teacher, died when Winnie was only eight years old. Throughout most of her adult life, Winnie Mandela has had to endure a forced separation from her husband ANC President Nelson Mandela, who spent 26 years of his life on Robben Island. Her father was a minister of the Forestry and Agriculture Department of the Transkei government during Kaizer Matanzima's rule. Born on September 26 1936 in Bizana, Transkei, Winnie was the fourth of eight children, of whom only three others are still living: these are her sisters Mobantu Mniki, who works as a teacher and Nonyaniso Khumalo, who is a housewife. Her brother Msuthu Madikizela is a bank manager in Bizana. Mandela did her primary education in Bizana and then went on to Shawbury to complete high school. A Social Work diploma followed at the Jan Hofmeyer School in Johannesburg, and thereafter a BA (Political Science) with an International Relations major at the University of the Witwatersrand, Johannesburg. "It was while working as the first black medical social worker at Baragwanath Hospital that I started to become politicized" says Mandela. "I started to realize the abject poverty under which most people were forced to live, the appalling conditions created by the inequalities of the system." "Above all, I became politically conscious through the research I had carried out in Alexandra township to establish the rate of infantile mortality - it was 10 deaths in every 1,000 births." Winnie Mandela's involvement in the South African liberation struggle dates to the '50s. Her first detention was in 1958, and coincided with the mass arrests of women involved in the anti-pass campaign. At the time, she was the chairperson of the Orlando West branch of both the ANC and the ANCWL. In terms of her first banning order, received in 1962, she was restricted to Soweto. Five years later she was arrested in Cape Town on a visit to her husband Nelson Mandela. She spent one month at the prison known as the Fort. In 1969 she became one of the first detainees under Section 6 of the notorious Terrorism Act. She was detained for 18 months in solitary confinement in the condemned cell at Pretoria Central before being charged under the Suppression of Communism Act. The famous "Trial of 22" took place in 1970. After initially being found guilty, Mandela and the other accused were discharged on appeal. 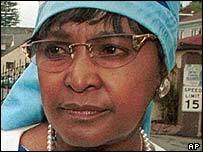 Winnie Mandela spent till September 1975 in prison in Kroonstad, along with her good friend Dorothy Nyembe. At the time of her release she was on the last national executive committee of the original ANC Women's League, along with other legends of the women's struggle like Lilian Ngoyi, Florence Matomela and Frances Baard. After it was banned, along with the ANC, these women leaders tried to continue their work through the Federation of South African Women. In 1976, following her activities during the school uprising, she again served six months at "Number 4" (The Fort). On May 16 1977 she was exiled, taken directly from her prison cell, to Brandfort for nine years. Here her house was bombed twice and she was once again arrested for defying her restriction order and returning to Johannesburg. Winnie Mandela's courage and leadership abilities have triumphed over years of political harassment, severe personal pain and a wave of media controversy to enable her to become the ANCWL's president.